The start of a new school year is often associated with good things such as seeing friends again after the summer. It may also bring with it certain worries, such as speaking in front of the class, meeting a new teacher or making new friends. Children with chronic diseases may experience additional concerns. They may feel uneasy telling others about their illness for fear of standing out from their peers and being teased, sometimes becoming less adherent to treatment regimens that might draw attention to their illness (e.g., having to take medications during class time). 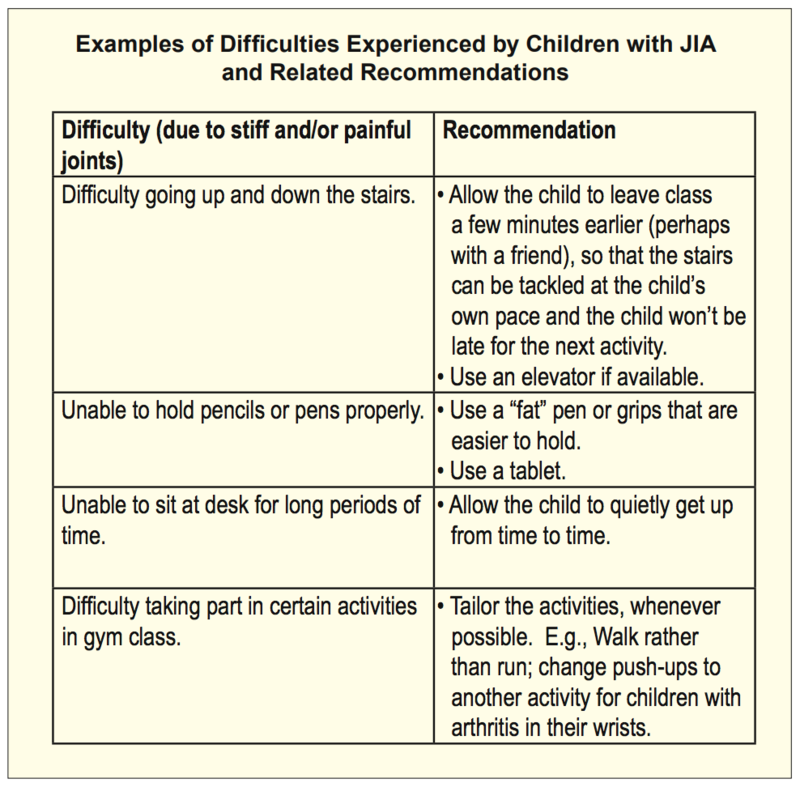 In the case of juvenile idiopathic arthritis ( JIA), where pain and stiffness of the joints and fatigue are experienced, children may also feel apprehensive regarding the additional time needed to perform specific tasks or the inability to do others. Stiffness in their joints may be experienced after periods of inactivity, making such things as writing and getting ready for recess/lunch difficult. Going up and down the stairs; using scissors; doing up zippers, buttons or shoelaces; sitting cross-legged during story time; or sitting at their desks for long periods of time may also be affected by stiff and painful joints that don’t have full range of motion. Such worries are often aggravated by the fact that individuals commonly associate arthritis with the elderly, unaware that even very young children may be diagnosed with arthritis (a disease which occurs in 1 in 1,000 Canadian children). Understandably, this makes it more difficult for children with JIA (and their parents) to successfully advocate for themselves. To assist them, an important collaboration was recently created between families, educators and healthcare professionals from the Children’s Hospital of Eastern Ontario (CHEO). At the very core of this collaboration were three essential elements: (1) educating others regarding JIA (2) supporting the educational, social, emotional and medical needs of children affected by JIA, enabling them to participate as fully as possible in the day-to-day activities of school, and (3) ongoing communication between families, educators and healthcare professionals. Recognizing that classmates also have the capacity to play a valuable supporting role in this collaboration, one of the rheumatology nurses at CHEO prepared age-specific, interactive presentations to educate primary school students about JIA and some of the practical difficulties faced by children with JIA as they navigate the school system. The presentations were used in a grade one and a grade five class, at the invitation of the families affected by JIA and their teachers. At the beginning of both presentations, it became clear that many of the children were already aware that something was different, having noticed that their classmate was sometimes slower at finishing things or occasionally absent from certain physical activities (they didn’t, however, know why). During the presentation, they listened attentively to the nurse and were eager to share their own experiences and knowledge. Although most of their understanding and familiarity with the disease came from older family relatives who had arthritis, the nurse explained that children can have arthritis too. The nurse brought a skeleton with her for the presentations, first showing the children what a normal joint looked like and how it worked, and then explaining how joints are affected by arthritis. She highlighted the variable nature of JIA, explaining how symptoms may vary from one day to another or within the same day. This helped the children to understand that their classmate might not be able to take part in certain morning activities when stiffness was likely an issue but was able to join them later in the day when it had improved. Students were encouraged to ask questions to clarify things and to suggest ways in which they could help their classmate. Why does she have it? We can help her go up and down the stairs or hold her bag for her. If she’s having a hard time doing something, we can help her, but we can tell her that she can do it. We know she can do it. Sitting amongst their classmates were the students with JIA. Somewhat nervous and shy as things started, they were encouraged to take part. The nurse discreetly provided them with a voice, mindful not to exclude them or make them feel uncomfortable or judged, while guiding the conversation in a way that normalized things. She felt that …normalizing things means that the child doesn’t define themselves by the disease and has more confidence… the child says, “I can do it.” and having her friends also say that she can do it, gives her that extra push and belief that she can accomplish the same things they can… It’s done to give the other students some suggestions as to how they can help their friend and that their friend is still the same friend… and they can still play with them. Following the presentation, the nurse left the school feeling that something positive had been accomplished. She recognized that closer friends had more of a vested interest in learning about the disease but felt that most of the class wanted to help. The foundation for a co-operative and supportive relationship had been developed, in which classmates understood more about what their friend was going through. With all chronic illnesses, it’s important that a partnership and open communication exist between families, educators and healthcare professionals. These school visits provided teachers and classmates with practical information regarding JIA, as well as additional support, reassurance and encouragement to children with JIA and their families. Michele Gibbon previously worked with the Rheumatology team at the Montreal Children’s Hospital, McGill University Health Centre and currently works with the Rheumatology team at the Children’s Hospital of Eastern Ontario in the position of Research Co-ordinator. She has managed country-wide research protocols about youth with juvenile idiopathic arthritis (JIA). Recently, she also co-authored a textbook chapter about JIA in Challenges Surrounding the Education of Children with Chronic Diseases, intended for teachers of primary school children.